In July of last year, I had to have shoulder surgery. In the process of X-rays and CAT scans and MRIs, a nodule was found on the right side of my chest. A nodule is a growth of cells that forms a lump.This concerned me a bit, but the doctors told me not to worry about it and to go ahead and have the shoulder surgery. They said that in six months they would check the nodule again. December came, and I got the nodule checked. To my relief, it was stable. -49 years-old. USA (New Hampshire). -Diagnosed with thyroid cancer less than a year ago. All was well, until I was told that during the CAT scan, two tumors were found on the right side of my thyroid. This came as a huge shock. January 8th was my 49th birthday, and how did I spend it? By getting three biopsies on my thyroid to determine whether or not they were cancerous. Doesn’t that sound like fun? Unfortunately, I was told a few days later that it was indeed thyroid cancer. However, I am really happy to say that my thyroid was removed along with three lymph nodes on March 1st. Sometime in April I will need to have Iodine treatment at a hospital. Iodine treatment is a form of radiotherapy, where a type of Iodine is used to find and eliminate the possible remaining thyroid cells in the body. Please wish me luck on that! In the midst of all this turmoil, I got really great news the day after my surgery. My surgeon told me that I will die an old man. I think that’s the best way of saying that I am a cancer survivor. Questions or anything to add about the thyroid nodule? We want your thoughts, please. You might just help someone else in need. Thank you for sharing your amazing surgery story! 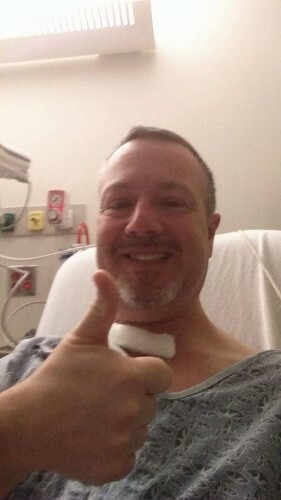 I can’t imagine what it would be like to have to get shoulder surgery only to find out that you dodged a bullet with the discovery of cancer. I have been thinking about getting shoulder surgery but first I have to get an MRI to know what is wrong exactly.